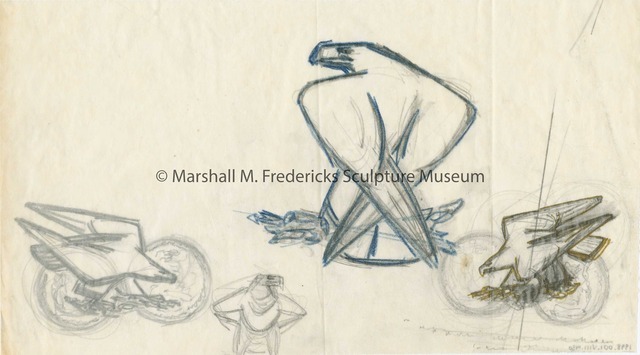 Marshall M. Fredericks Sculpture Museum | Sketches for "Eaton War Memorial Eagle"
Sketches for "Eaton War Memorial Eagle"
The Eaton Manufacturing Company in Cleveland, Ohio commissioned this memorial in honor of the employees who died in World War II. A marble wall inscribed with the names of those employees who gave their lives for their country holds the bronze relief. The eagle is the most prominent element. The simplified details of the eagle's body and feathers are typical of Fredericks’ style. The face and obverse of the medallion are visible in the relief. The eagle’s talons grasp an olive branch and arrows signifying a capacity for both peace and war. On the obverse of the medallion, encircling the inscription is a laurel branch on the left and an oak branch on the right. These signify victory and strength. 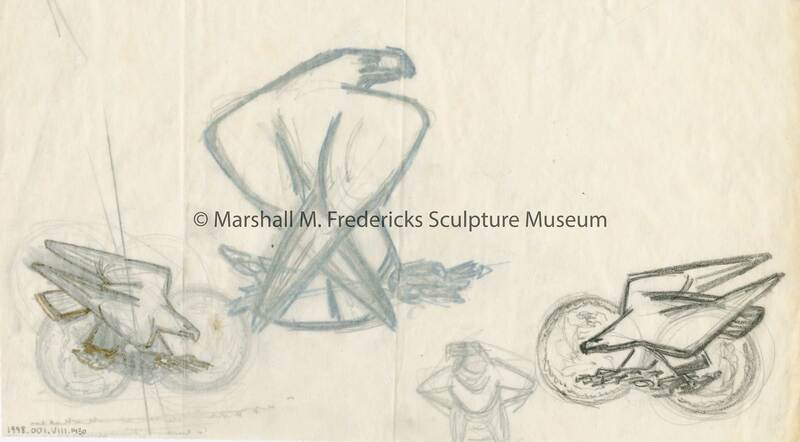 Fredericks also designed a medallion for the Eaton Manufacturing Corporation in 1948. 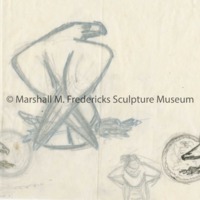 Fredericks, Marshall M., 1908-1998, “Sketches for "Eaton War Memorial Eagle",” Marshall M. Fredericks Sculpture Museum, accessed April 21, 2019, http://omeka.svsu.edu/items/show/7657.